I recently picked up a HTA 12 inch active/passive Subwoofer. Does anybody know the power handling capibility of this unit? Does anybody have the owners manual or literature to this unit? I think what you have is a Model 234. Nice score! I saw that on ebay and was very tempted but the shipping to NJ put me off. I have the HTA satellites and passive sub. but there does not seem to be a lot of info on Cizek speakers in general. There should be! Cizek speakers are really nice. Below is all I can find on the 234. I "thought" the "active" part meant there is an internal amp, but reading the little description below makes me think maybe not. I'll be interested to know what you learn. The biggest Cizek fan/expert here is Paolo Lippe. Maybe try sending him a PM and see if he's familiar with the 234. We've also had some Cizek relatives comment here. You may get lucky. Thanks for the help Kent. I will PM Paolo and see what he says. So far the subwoofer works ok. In testing it, when I cranked it up, it was making a buzzing noise. Upon inspection of the speaker, I found that part of the cone had seperated. I removed the speaker and tested it with an ohm meter and it was ok. So I am going to send it out to be re-coned. The box is built like a tank and heavy as hell. It is a sealed box and stuffed soild with wool packing. The wood is in good shape with some minor scratches and I have refinished the box with Howards Restore-a-Finish. Looks just like brand new. So, just waiting on the speaker to get back from re-coning and I will give you an update. Update on the project. I had to get the speaker re-coned. I just got it back and installed it and it sounds good. The bass is nice and tight but, not earthshaking. I am pushing this with a 200+ watt SAE amp. 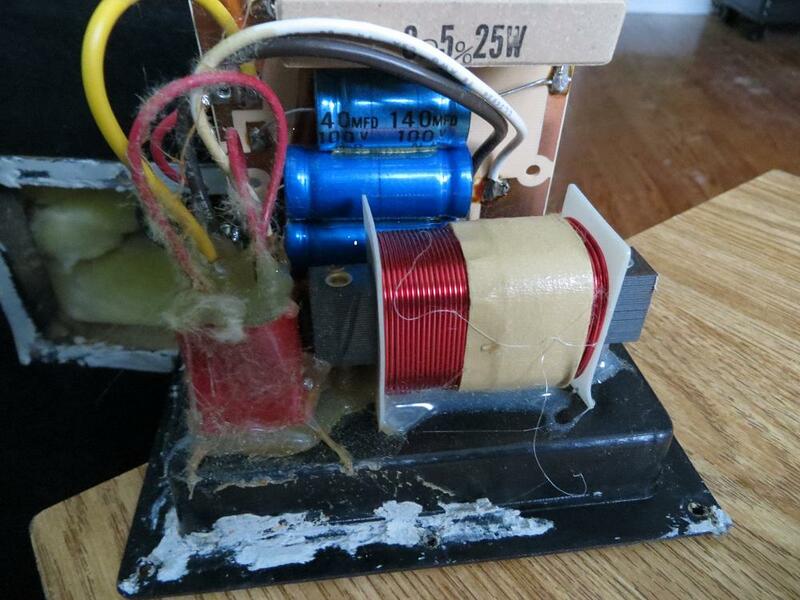 As Kent noted, they overstuff these speakers from the factory, so I removed about half the stuffing and re-tested it. MUCH BETTER, Bass is still tight but now it has some thump. Not a virbrate the nails out of your floor thump, but some good soild bass. So quite happy with the results. I was thinking of re-capping them but the caps are glued to the circuit board which incorporates the pasive/active switch and speaker connectors. If I break the circuit board, I will be out of luck. I am sure this would sound better with a new set of caps. So I am debating as to re-cap it or just leave it and enjoy it. I will take some pictures of the finished product. can you post a photo of the XO? On my HTA sats the caps were glued on with hot melt. Not hard to remove. Or you could leave the original caps, cut the leads and add the new ones. Don't use hot melt on film caps--it can cause damage. Can' t figure out how to post the pictures. This is the crossover. Pretty simple. One transformer, Two 8 0hm 25 watt resistors in parallel, a 140 mfd capacitor and two (cant read rating) other capacitors. All hot glued to the thin circuit board. Not real complex or anything.. My main concern is not breaking or messing up the thin circuit board..
Well, they don't "look" bad and they're not ancient. You could leave them. I think if you cut or desolder them you can probably pop them off without breaking the board but you'll have to decide if you want to take the risk. FYI, attached is a photo of the satellite crossover. I will just leave them. They work great and sound good. I am just surprised at the sloppy workmanship on them. Your satalite crossovers look so much better. Are those original or did you re-build them? I would have thought that Cizek would assemble their crossovers simular to Klipsch. Nice wooden (or Plastic) mounting board and everything fastened on with screws and/or soldered nice and neatly. The hot glue fastening method is so tacky. I guess they were trying to save a few dollars. But they work and sound fine. Those are original. I've seen other crossovers from the 80s and they all seem to have used hot melt glue. Actually, that speaker has an odd history. I bought it as a single speaker--paid too much for what it was. Later learned the tweeter was bad and then the woofer was irreparably damaged when I sent it out to be refoamed. Turned out the tweeter was a SEAS H0581-06 25TAC/CDW-HTA. No longer in production. They said the H1147-06 27TBC/G was a similar current tweeter. Madisound sold a SEAS H9932 replacement voice coil for the H1147. I was able to modify the new VC by truncating the faceplate and using different screws. Worked fine but what about the woofer? The HTA sats are VERY shallow--only about 1 1/2" deep. I looked at several possible 3-1/2" woofers most would not fit. Luckily, at the time PE had a closeout (part # 299-146) for $8 that dropped right in. It's 8 ohms as opposed to the 4 ohms of the original but I'm using it as a single rear channel speaker, so it's "OK". There are other 3.5" woofers that "may" work: Vifa TC9FD-18-04 (4 ohms but deeper and slightly smaller diameter so maybe not), or Peerless V-Line TG9FD10-04 3" Full Range 4 ohm. Maybe a Peerless TG9FD10-08 (again, 8 ohms). And I have no idea how the specs on these compare to the original. I've since bought a complete HTA 3-piece system and will be looking for a place to use it. 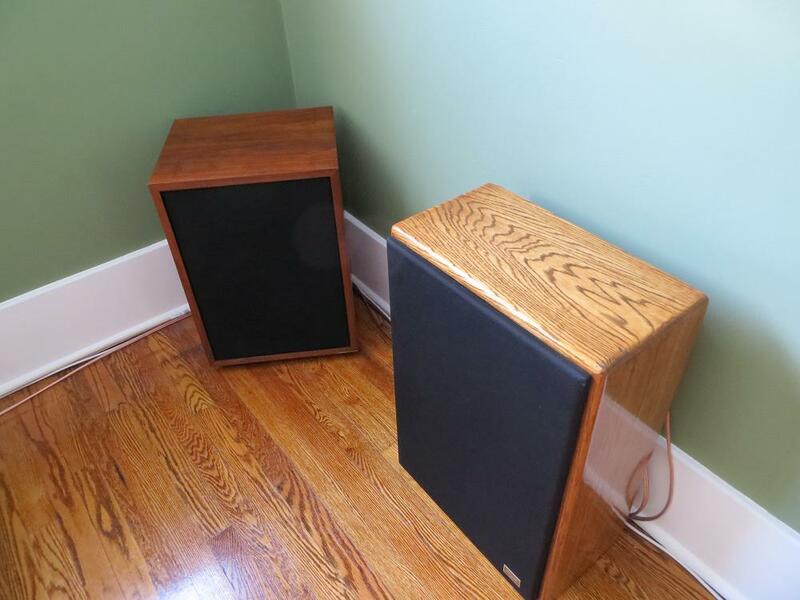 Here are some pictures of the Model 234 in action with a pair of Klipsch Heresys run through it. Once I get the Model 1's set up, I will post some pics of the trio.